Jen and Carter's Journey Thru Life and Infertility! Praising God for our Miracle. : Update/Random Thoughts! Sorry for being MIA for the last week, it has been a roller coaster of a week in the Baker House. As most of you know that we put our Sophia Girl down( our puppy) a week ago last Friday. We miss her so much and I regret doing what we did, maybe in time I will realize that we did it for Noah safety. I miss coming home to being greeted at the door, or someone begging for the leftovers on the plate. She was a good puppy for us just not to others that would come to visit.I cry very time I walk in to the house thinking that she is going to come running to greet me. We started our Preparing for Child Birthing Classes last Monday night. It was okay, learned a few things that I didn't know, like with signs to look for labor, some other interesting things, I think that Carter was alittle bored with it. We watched a video of an baby being born. We have two more classes to go to, the last class we get a tour of the department. I am planning on taking the Breastfeeding class as well which is the last week of July. I can't believe how fast the pregnancy has gone. I had an Ob appt last Wednesday(32wks 4 days) and Noah is sounding good, his heart rate was 142. She said that I am measuring where I need to be and she was poking on my belly and his head was up in the right side under my ribs, and she said well looks like he is breach now. She is not sure if he can turn since it is getting cramped in there and my bicornuate uterus shaped. He had been laying right on my sciatic nerve, and that why it is hurting cause of the way he was laying. I see her on the 22d of July for my next appt and the 30th for the strep screen and another ultrasound to see how he is laying in there. I can't believe in less the 5 weeks or less I will get to meet this little miracle. My sugars have been decent for the most part, they normal run high in the evenings for supper. She told me that I could go to every other day of checking them if I wanted to. I have Noah's bag packed, the nursery is ready for his arrival. I have a feeling that I am not going to make it to my due date. I have been having dreams that my water has broke, I had some contraction last night bout 8 mins apart, nothing to big . I am feeling pretty good for the most part, beside the lower back pain mostly at night and the bad heartburn and ingestion. I love feeling him move in there, which has slowed down some, I am sure to the lack of room in there. I'm praying for your remaining 5 weeks of pregnancy! How exciting! I can't wait to be that close to meeting my little guy! 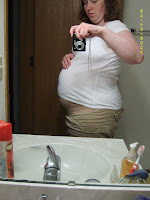 I have been wondering if Quin is breech, I always feel strong kicks on the bottom right side of my belly. 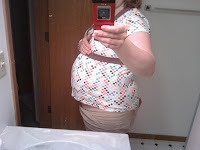 I go for my 32 week appt. next Tuesday...hopefully they can tell me where he is in there!